Jones Myers has donated festive gifts to light up Christmas for families who have been victims of domestic abuse and are now living in a refuge. 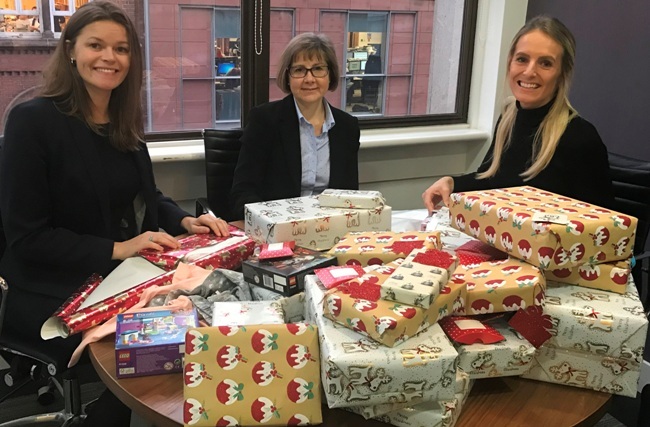 The Leeds and Harrogate specialist family law firm has provided vouchers, food, confectionary and children’s parcels for mothers and children supported by Independent Domestic Abuse Services (IDAS). IDAS, Yorkshire’s largest specialist charity, provides services including refuge accommodation, community-based support, peer mentoring, group work and access to a free, confidential out-of-hours helpline. Rose Merritt, IDAS business development manager, said: “Domestic abuse can intensity over the festive period which can be a challenging time for victims. Many people will have suffered financial abuse and may have little access to money – making this expensive time of year very difficult. During their stay at the refuges, IDAS helps families to overcome the effects of abuse and assists them with benefits, schools, legal issues and housing. Male victims are also supported in self-contained flats or houses in locations including Harrogate.